I set my alarm this morning, so I can see and photograph our arrival in Pago Pago. The island of Tutuila is strikingly beautiful, with tall craggy mountains covered in vegetation. The channel into Pago Pago harbour is narrow, and the harbour itself is quite small, however there was a cruise ship docked ahead of us – the Sapphire Princess. She is huge compared with Volendam. Needless to say, it is pure bedlam in the little town with two cruise ships in port at once. I go ashore for an hour in the morning. Once I find the post office and mail my postcards, I wander up to the Governor’s Mansion. The guards chase me out of there, so I return to the ship, since it is so hot and humid. I am glad to return to the comfort of the ship, and immediately go for a swim in the pool. There are some tropical downpours while I am swimming. There are some Samoan visitors to the ship today. They all have cameras and are taking photos of themselves, so I volunteer to take their photos so everyone could get into the shots. As we depart the very pretty harbour of Pago Pago, I take sequential photos in order to build a time lapse video of our departure. Volendam Departs Pago Pago 2010 – time lapse from JoeTourist InfoSystems on Vimeo. The Holland America cruise ship Volendam sailed from Vancouver, Canada to Auckland, New Zealand September 22 to Oct 22, 2010. 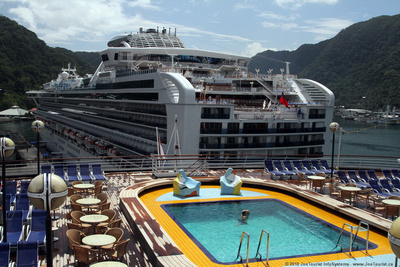 This entry was posted in American Samoa and tagged cruise ship, harbor, harbour, island, ship. Bookmark the permalink.